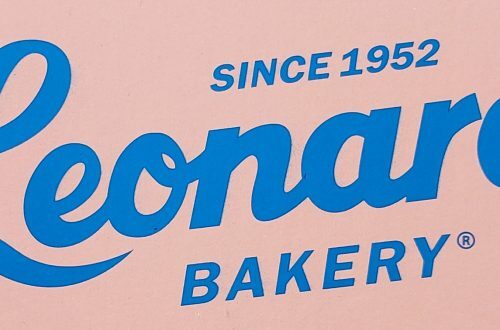 Oahu’s North Shore is known for many things. Gorgeous beaches. Huge waves. Laid back vibes. And garlic shrimp. 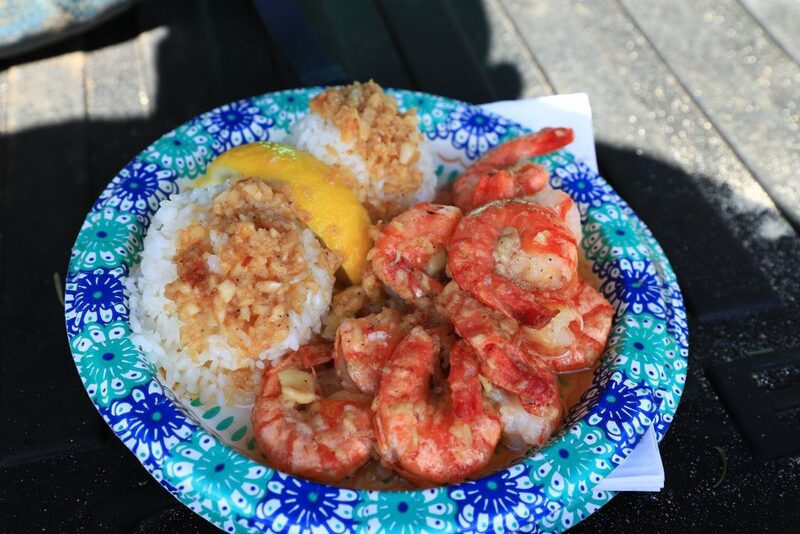 Garlic shrimp can be found all over Oahu’s North Shore and it is one of the must do things when you visit the island. But who has the best shrimp? With all the different choices where should you go? Everyone that lives here has their go-to location. Some locations are local secrets while others have grown to be quite well known. 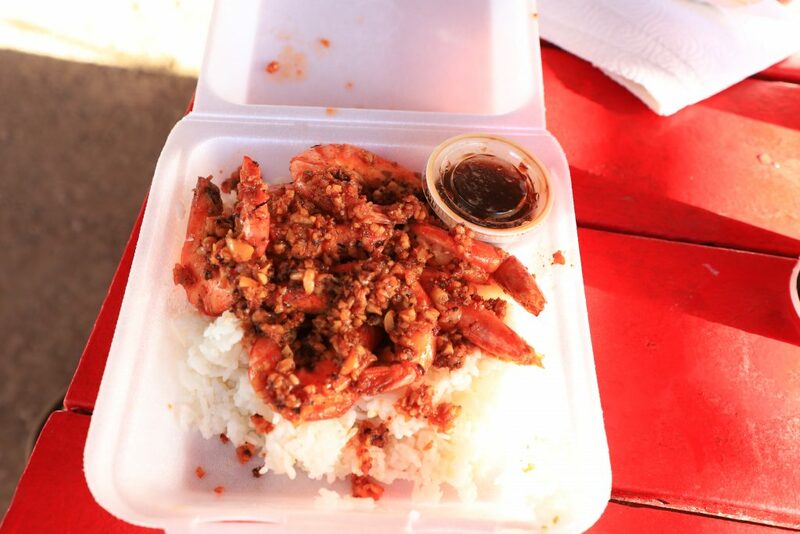 Since I’ve lived on Oahu there are three different shrimp locations I always hear come up in conversation. Whether in person or online and they seem to always be compared to one another. Giovanni’s, Fumi’s and Romy’s. 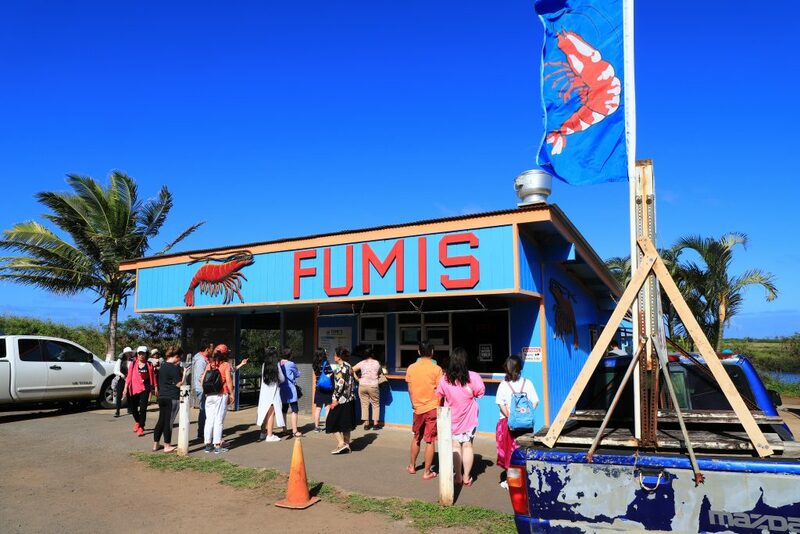 Since living on Oahu I had tried Giovanni’s once, it seems to have lots on online hype, and Fumi’s, but I thought it would be fun to compare these three popular shrimp locations side by side. See how they stack up against one another and see if any of them are worth the talk. I’ve wanted to do this for awhile, but because I have my own go-to shrimp locations on North Shore, I never made it to all three and even if I would have, the visits would have been to far apart to accurately compare the three of them. 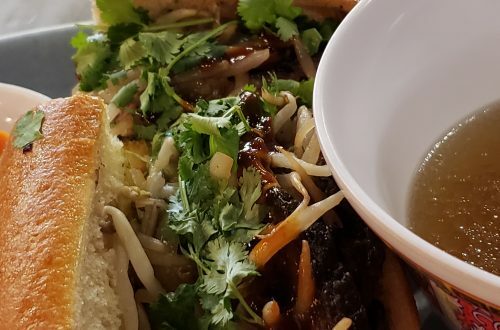 So, to accurately compare the three of them, with only a month left here on Oahu, my husband and I decided we would stop at each location, one right after the other, all in one day, and compare our meals as we went. We ordered one garlic shrimp plate and a soda at each location. As we would eat we would take notes on our meal in seven different categories. We didn’t want the food to sit, we wanted to enjoy each plate as it is intended. 12:54-1:01 to order, 1:01-1:15 for food. Total wait time 21 minutes. The shrimp smelled and appeared to have lots of garlic, but overall was very bland. Shrimp was tough and chewy. Giovanni’s shrimp is very difficult to eat. The shrimp is served in the shell and it does not peal ease. Not one of my shrimp was I able to cleanly remove the tail. Shrimp is served with rice topped with garlic. Despite the abundance of garlic the rice was also very bland. .
For $15.50 we received 12 shrimp, two scoops of rice and a can of Pepsi. This was my second time eating at Giovanni’s. The shrimp is bland, but it’s not the worse I have had. The line can be insane, but for its length they do seem to move pretty quick. 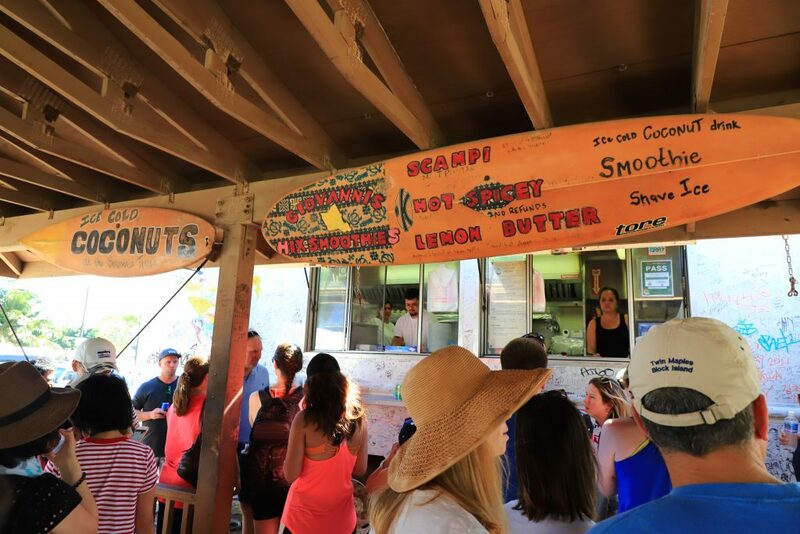 Giovanni’s does give you the novelty experience of being able to sign their truck and, surrounded by other food vendors and retailers, the location isn’t too bad. 1:40-1:46 to order, 1:46-1:58 for food. Total wait time 18 minutes. 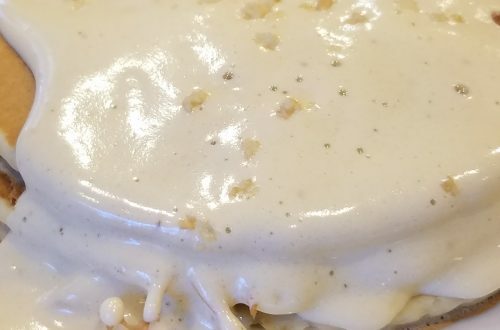 Very buttery with lots of garlic. You could see actual slices of garlic. Shrimp was slightly chewy, but came cleanly out of the shell. Fumi’s shrimp peeled easy and came out of the tail clean. Shrimp is served with rice which is well cooked with lots of garlic. The plate also comes with a slice of fresh pineapple and corn that appears to come out of a can. For $15.50 we received eight shrimp, two scoops of rice, one pineapple slice, a serving of corn, and a can of Pepsi. Fumi’s has lots of tables located in the shade of several trees. Between the three locations was by far my favorite. The shrimp was the most flavorful and I enjoyed the nice fresh slice of pineapple to finish off the meal. The service was the quickest of the three locations as well. Also, on an unrelated note they serve Dole Whip on site. 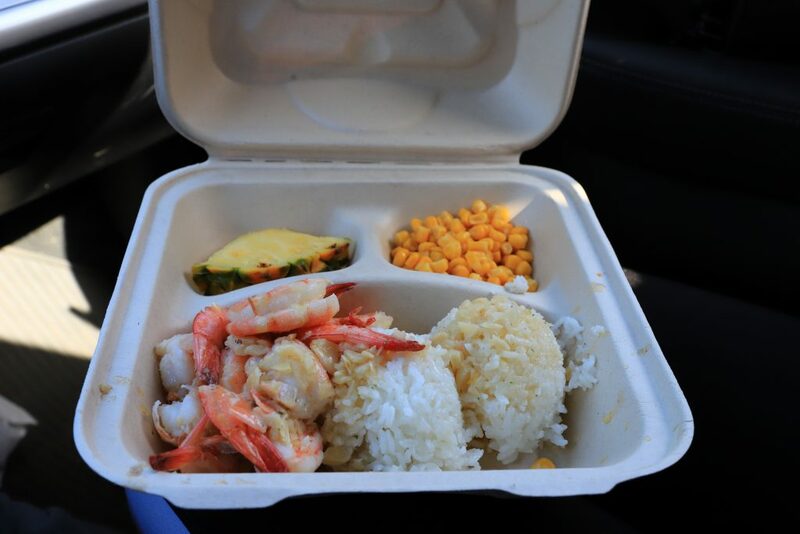 Garlic Shrimp Plate from Fumi’s with rice, pineapple and corn. 2:09-2:46 to order, 2:46-3:55 for food. Total wait time one hour and 46 minutes. Shrimp was covered in a pile of burnt garlic. Romy’s shrimp was tough and chewy. It was impossible to cleanly peel any of the shrimp. This shrimp was nearly impossible to eat. Not only did I struggle to remove the shrimp from the tail, but even the body shell broke into tiny pieces as I tried to peal it. Shrimp is served a top a pile of rice with a spicy shoyu sauce. For $17.25 we received eight shrimp and a medium coke with ice. Romy’s had the nicest setting. They had lots of tables spread out under a canopy. Romy’s was the absolute worse of the three. The wait time was ridiculous. 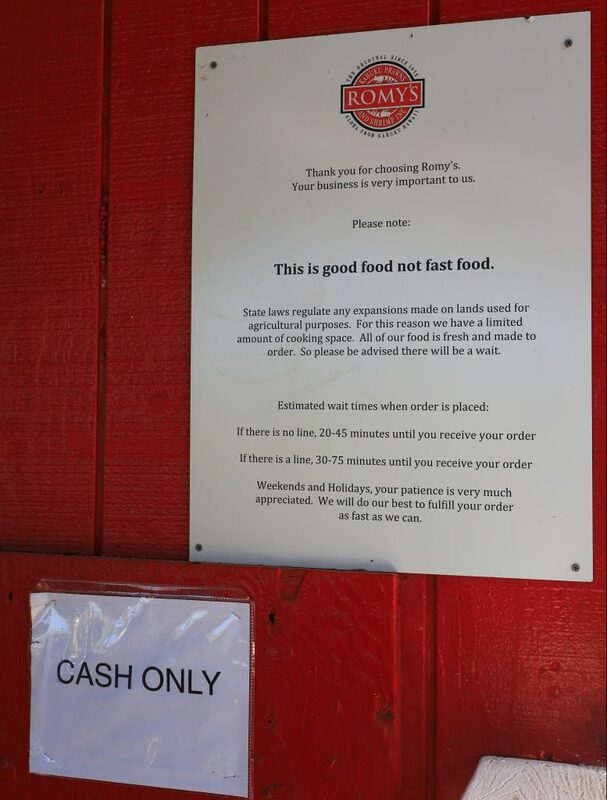 They do state across multiple signs that they are “good food not fast food” and that the wait would be long, so I knew what I was getting into, but if I’m going to wait nearly two hours for my plate that food better be perfect. Instead I received over cooked shrimp topped with clearly burnt garlic that left a horrible after taste in my mouth. Romy’s does how every probably have the nicest seating area to accommodate your two hour wait. Nearly a two hour wait for Romy’s Garlic Shrimp plate. Overall I do not regret my North Shore Garlic Shrimp Adventure. It was fun to test out these popular locations and compare them side by side. I do think there are better shrimp options in the area, but if you’d like to try one of these locations I’d recommend either Fumi’s or Giovanni’s.